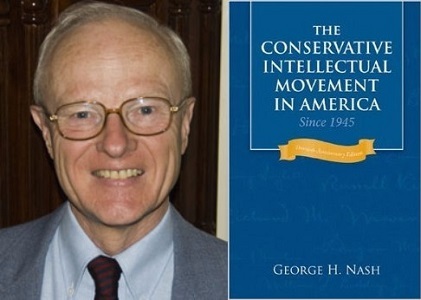 Author and historian George H. Nash, Ph.D., will present the lecture "American Conservatism and the Problem of Populism: Where Does Trump Fit In?" on Wednesday, November 14 at 5 p.m. in Knott Auditorium at Mount St. Mary's University. Nash is one of the leading authorities on conservatism, particularly American conservatism. He wrote the classic work The Conservative Intellectual Movement in America Since 1945 and is the preeminent biographer of Herbert Hoover. Nash authored the multi-volume biography of "Herbert Hoover: The Engineer: 1874–1914"; "The Humanitarian: 1914–1917" and "The Master of Emergencies: 1917-1918." More recently, Nash wrote Reappraising the Right: The Past and Future of American Conservatism. He has lectured and written extensively on twentieth-century American political and intellectual history. Hosted by the Philosophy, Politics and Economics program, the College of Liberal Arts and the Office of Competitive Fellowships, Nash's lecture is free and open to the public.